The weekend Greenmarkets are teaming with different varieties of winter squash. Yellow, orange and green hues paint a hodgepodge of shapes and sizes, from little and squat to big and round. Displayed like this, the squash can seem almost daunting: what epicurean means are hiding inside this rotund, seemingly impermeable vegetable? For spaghetti squash, the result is surprising — but delightfully so. The oblong, heavy object purchased at the market (I bought mine at Stannard Farms at Tompkins Square on Sunday) transforms itself delicate, tender ribbons of flesh in the kitchen, replicating the exact width and consistency of spaghetti. But don’t think the veggie-for-grain swap out is an even substitution in terms of health. Spaghetti squash might mimic spaghetti pasta in texture, but its wealth of nutrition’s makes the substitute’s value so much more. An excellent source of dietary fiber and vitamin C, spaghetti squash also contains vitamin B6, potassium, and magnesium. Plus, it’s low-cal: one cup of spaghetti squash averages 42 calories, while one cup of spaghetti is about 220. Upon roasting, spaghetti squash emits a lovely, flowery flavor; subtle but earthy. Because it is not as sweet as other winter squash varieties, sprinkling a generous spoonful of brown sugar atop the yellow strands is the best way to eat it “plain”. To retain the modest flavors, prepare with a light garnish, such as a mild cheese seasoned with herbs and nuts. This Spaghetti Squash with Ricotta, Hazelnuts & Parsley recipe uses hazelnuts and breadcrumbs to offer a crunchy contrast to the silky spaghetti ribbons. *Breadcrumbs can be toasted in a lightly oil pan over medium heat, for about 2 minutes, or in the oven along with the squash for 2 minutes. 1. Preheat oven to 400 degrees. Brush cut sides of squash with ½ tablespoon oil (or spritz with an olive oil mister), salt & and pepper. Place squash, cut sides down, on a rimmed baking sheet lined with foil. Roast until tender, about 45 minutes. Let cool for 5-10 minutes. 2. With a fork, scrape the flesh of the squash to extract its long strands. Transfer to a large bowl. Add tablespoon of olive oil, ricotta, nutmeg, brown sugar, parsley, breadcrumbs, and hazelnuts, plus additional salt and pepper to taste. Toss all ingredients together and serve immediately, while squash is still warm. "Squash, Winter, Spaghetti, Cooked, Boiled, Drained, or Baked, without Salt Read More Http://nutritiondata.self.com/facts/vegetables-and-vegetable-products/2655/2#ixzz29lqicn8w." SELF Nutrition Data. SELF Magazine, n.d. Web. <http://nutritiondata.self.com/facts/vegetables-and-vegetable-products/2655/2>. Vynckt, Virginia V. "Spaghetti Squash Nutrition Value." LiveStrong.com. N.p., 8 May 2011. Web. 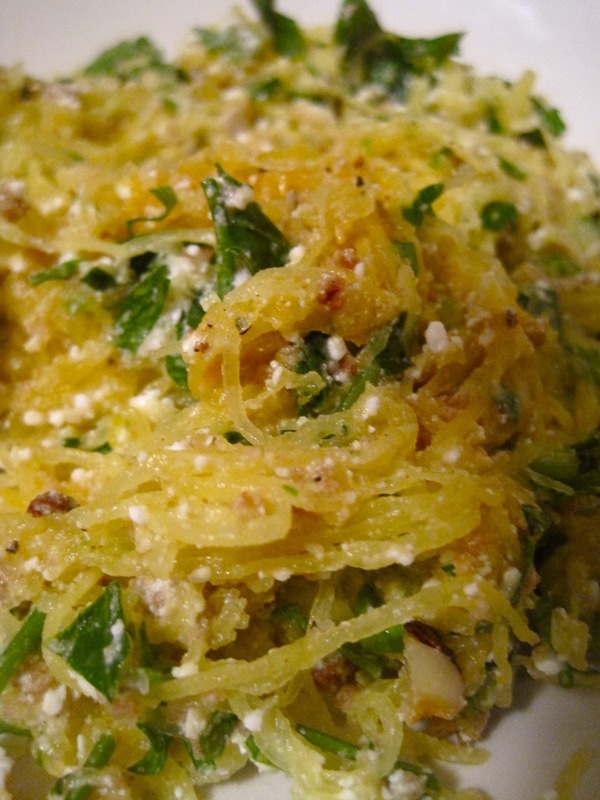 <http://www.livestrong.com/article/86012-spaghetti-squash-nutrition-value/>. Um, YUM! I never know how to cook squash, and this looks like a really easy recipe that is bursting with fall flavor. Also, love the site makeover! It makes your pictures stand out that much more.